Babu’s Camp is located in Mkomazi National Park, about 2 ½ hours drive southeast of Arusha, about 11 kilometres from Zange park gate and a little more than an hour’s drive from the Mkomazi Rhino Sanctuary. Babu’s Camp by The Anasa Safari Collection is a semi-permanent tented camp located in the undiscovered Mkomazi National Park, offering a peaceful experience in a beautiful African landscape. This private camp offers a peaceful, relaxing experience in a beautiful African landscape where today one can still enjoy the whole park as though it is ones own. The Mkomazi National Park is a spectacular wildlife and wilderness destination, excellent for birding as well. Babu’s Camp is situated approximately two and a half hours southeast of Arusha by road, and a 40 minute flight by air from Kilimanjaro Airport. Babu’s Camp has six large canvas safari tents with en-suite facilities. Each tent has an en-suite bathroom with flush toilets and hot showers. 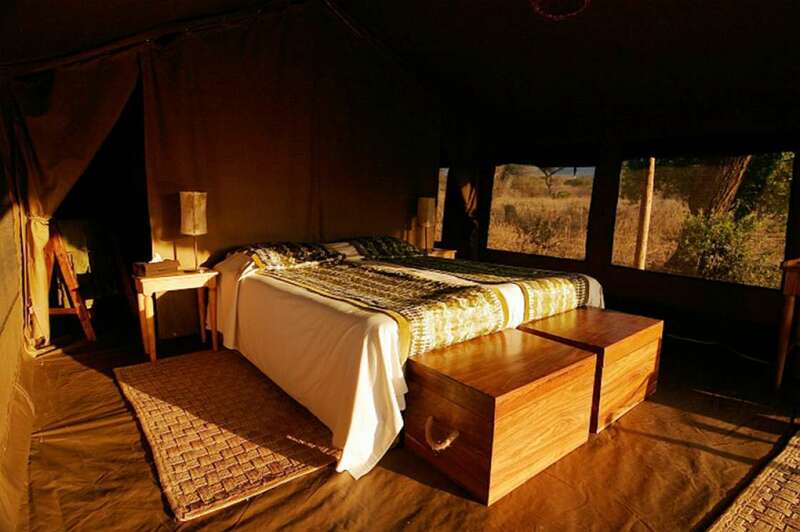 The Tents well-attended and are beautifully set among baobab trees and acacia and are comfortably furnished with a large hand carved wooden bed or twin beds, wardrobe, changing area, safari chairs, and a writing desk. Each tent has an attached bathroom with a flush toilet and hot shower. Electricity is provided by a silenced generator (220 Volt from 07h00 to 09h00 and 18h30 to 23h00 daily), which provides lighting throughout the camp and in the tents. Being a traditional camp there is no email or phone communication for guests; the camp is equipped with an HF radio in the event of an emergency. The dining tent at Babu’s Camp Mkomazi offers ample seating inside and out, with a full-service bar. With views of Kilimanjaro, guests can walk or drive in the Mkomazi National Park. It not only provides a home to a tremendous variety of wildlife, it symbolizes a traditional East African safari. There is a wide variety of flora and fauna with over 78 species of mammals in the park, including elephants and giraffes. The endangered African wild dog and black rhino have been introduced to Mkomazi, with the aid of the Wildlife Preservation Trust.